: The breed belongs to the group of scent hounds which have spread throughout the Balkan territory. It is thought that the scent hounds from Asia Minor played an important part in its genesis. 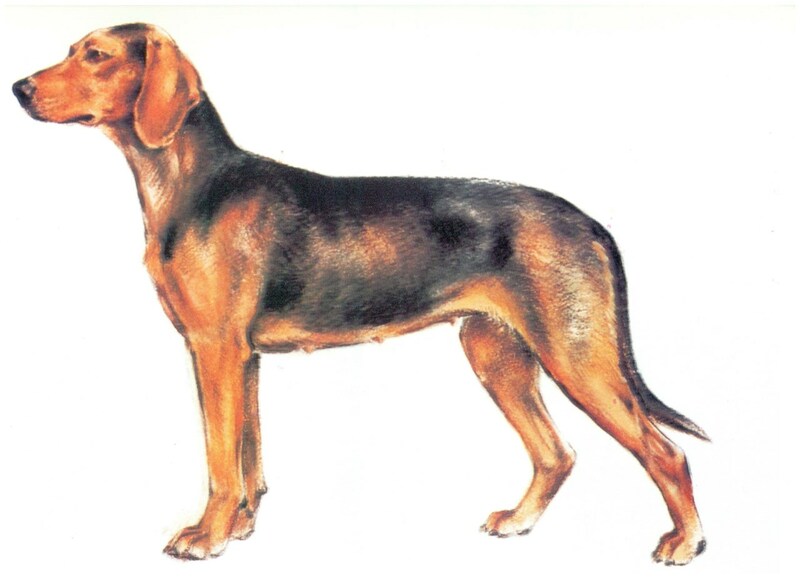 The first description of this breed under the name of Balkan scent hound dates from 1005 ; for this we are endebted to Frank Laska who described this breed together with other scent hounds. The first standard was drawn up in 1924 , but it was only at its session in Bled on May 14th 1940 that the F.C.I. adopted the standards already announced in Stockholm in 1939 and among these was included that of the Balkan scent hound. Because the breed was most widespread in Serbia, it was the Yugoslav Cynological Association which controlled breeding and put in place the first registrations in the official stud book. On November 12th 1996,during its meeting in Copenhagen, the General Committee of the F .C.I. discussed the motion put forward by the annual general meeting of the Yugoslav Cynological Association, and accepted that the name Balkan scent hound be replaced by Serbian hound. : Dog of medium size with a robust constitution. Full of character, it is lively and energetic. Length of body measured from point of shoulder to point of buttock is 10% greater than height at withers. Girth of chest is 20% more than height at withers. Length of head corresponds to 45% of height at withers. : Kind, with lively temperament. Dependable, showing remarkable tenacity. : Dolichocephalic ( narrow skull base coupled with great length ) ; top lines of skull and foreface are divergent. : Seen from the front and in profile, the skull is slightly rounded with a pronounced frontal furrow. Occipital crest not very defined. Width between ears is less than or equal to distance between stop and occipital crest. Pronounced superciliary ridges. : Cuneiform, a little shorter than the skull ; ideal relation between length of muzzle and that of skull is 9 to 10. The muzzle tapers progressively from stop to nose. The foreface is straight. : Mediumly developed, mediumly thick and fitting well with the jaw. The edges of the lips should be black. The upper lip overlaps the lower lip ; corners of lips are firm. : Powerful jaws. Teeth are strong with regular complete scissor bite. Pincer bite allowed. : Medium size, oval, set slightly slanting. Edges of lids are dark in colour ( preferably black ). Colour of iris as dark as possible. : Set high, of medium length and width, pendulous, close to cheeks. The tip of the ear is slightly oval in shape. Ears are thinner than thick. : Strong. In length approximately the same as the head. Top line is slightly arched. It is at an angle of 45-50 degrees to the horizontal plane. : Slightly oblong, with length 10% more than height at withers. : Well-muscled. length about the same as the croup. : Slightly sloping ( 20-25 degrees in relation to horizontal ). Powerful, well-muscled broad. : Strong; height 50% of height at withers and girth 20% greater than height at withers. : The oval point of the sternum stands slightly proud. Belly has slight tuk up. : Extends line of croup. At the base it is strong and tapers progressively towards tip which reaches level of hock. Sligthly curved up, it is carried below line of back. Covered in abundant hair. : Powerful, well-muscled , parallel. : Scapula (shouder blade): Length corresponds approximately to that of upper arm. Muscled, solid and well-attached to the thoracic wall. Forms an angle of 45-50 degrees to horizontal. : Powerful, muscled, approximately same length as scapula. : Solid, close to body .Distance from elbow to ground is 50 % of height at withers. : Pasterns (Metacarpus): Powerful, slightly sloping ( up to 15 % from vertical ). : Cat foot, with solid tight toes. Nails are strong and black in colour. : A little longer than the front foot, with solid tight toes. Nails strong and black. Pads are resilient and adequately elastic. : Strong flat, well-muscled and parallel. : Solid, parallel with median line of body. Angle of stifle around 120 degrees. : Well-muscled, length approximatively that of thigh. : Powerful, well let down. AngIe of 135-140 degrees. : At the walk good front extension. Preferred gait, free energetic trot. Umbs move on parallel axis to median plane of the body. : Elastic and well-pigmented , taut over body . : Short, abundant, glearning, quite thick and lying well over all the body with undercoat. Hair slightly longer on back of thighs and underside of tail. : Red ( fox coloured ) going from yellowy red to a rust tone with black mantle or saddle. The mantle or saddle go as far as the head which shows black marks on either side of the temples; on the chest a round white mark no larger than 2 cm in diameter is allowed. Males 46 -56 cm, ideal height between 51 and 52 cm. Females 44 -54 cm, ideal height between 48 and 49 cm. Missing tooth, although the absence of two premolars ( 2PM 1 ) is tolerated. Tail curled, carried high or curving over back tip of tail hooked or crooked. White mark on chest larger than permitted size or presence of white mark anywhere else. Height at withers greater or lesser than that laid down in the standard.